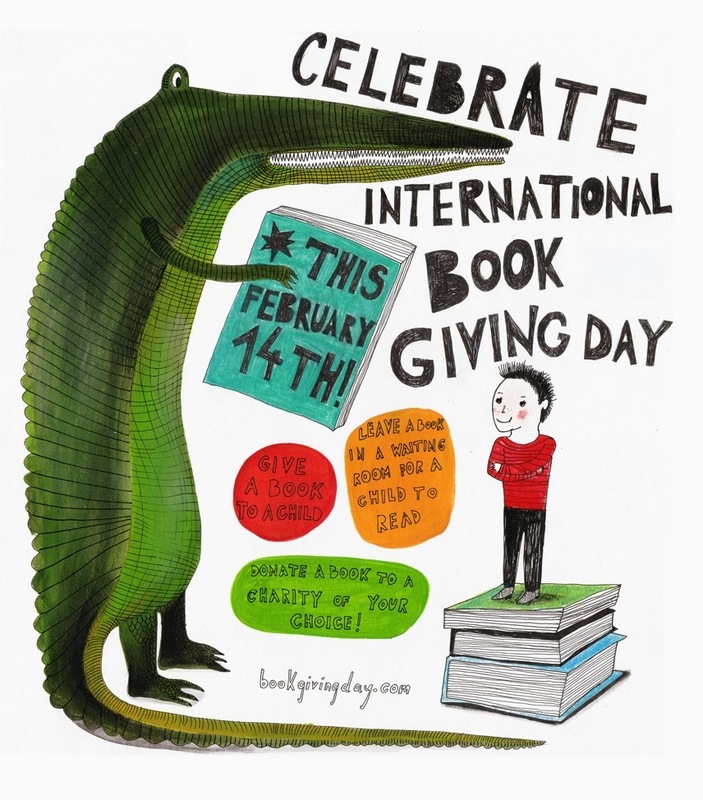 Press Release: Celebrate International Book Giving Day on February 14! International Book Giving Day, February 14, is a day dedicated to getting new, used, and borrowed books into the hands of as many children as possible. Share the love of books and the generosity of giving . . . all on a day synonymous with love. International Book Giving Day was built and created by Amy Broadmoore, founder of the American children’s book website, Delightful Children’s Books, in 2012. Inspired by her son’s desire to "invent a holiday when people gave books to each other," the determination to link that with Valentine’s Day was born just 10 days before the day itself! Within a short space of time Amy’s initiative has continued to grow, sparking enthusiastic responses from across the globe. "I used the connections I had as a children's book blogger to invite people from around the world to celebrate International Book Giving Day." Amy continues: "People not only give books to kids in their communities, they also share stories and photos via Twitter, Facebook, and International Book Giving Day's website. Connecting with others who are giving books to kids is part of what makes this an inspiring holiday." The support of well-known authors and bloggers has been instrumental in International Book Giving Day's success. 2014 sees an increased presence of Emma Perry of My Book Corner - UK, as Amy creates a little more room to squeeze in even more bookish projects. Perry says: "The enthusiasm from all who hear about International Book Giving Day is infectious. The reaction I’m getting already really is wonderful - illustrators are donating their time, children are donating books to other children, and independent bookstores are in love with the philosophy behind the day." International Book Giving Day has received great support from well known children’s authors from around the world: Mem Fox, Clara Vulliamy, Dub Leffler, Katrina Germein, Chris Haughton, Sindiwe Magona, Ed Emberley, Dianne Wolfer, Kathryn Apel, Ed Vere, Claire Wildish, Peter H. Reynolds, Sandy Fussell, Priya Kuriyan, Janeen Brian, Barney Saltzberg, Hazel Edwards, and Frane Lessac have all given books to children on February 14 and have encouraged others to do the same. The beauty of International Book Giving Day is its simplicity. Participants do not need to organize a huge event to take part. Gift a book to a child who would enjoy receiving a book on February 14. A perfect alternative to overpriced chocolate . . . although chocolates still make a good present! 2. Leaving a book somewhere. Choose a waiting room where kids are stuck. Purchase a good book and deposit your book covertly or overtly in your waiting room of choice. Try leaving books in playgrounds. The goal here is to spread the love of reading to kids! Donate books to a school library, children’s hospital, or nonprofit organization working to ensure that all kids have access to books. Participants are encouraged to let us know they are participating at http://bookgivingday.com. Photos of Book Giving Day festivities are shared each year on social media, by adding the hashtag #giveabook to Instagram / Twitter / Facebook photos or by emailing photos to amy.broadmoore@gmail.com. Let’s see how many people we can get to commit to giving a book to a child on February 14!